I’m so excited, can’t stand it. I have one full row of Grandmother’s Diamond Ring, a design by Judy Martin, finished. I love it!!! 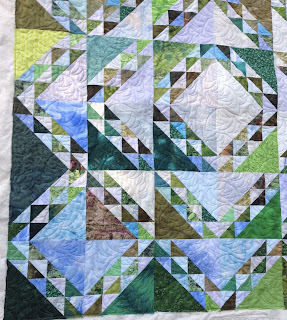 I’ve figured out the stitching path, and I can go from one side to the other without stopping now, which is a big added bonus. Much faster, and less thread ends to have to tie off and bury. It’s time for a break for something to eat, and then I’ll be back at it again this evening. 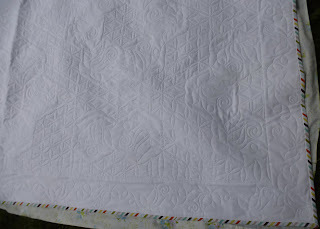 I’ve finished quilting Northern Tree Line, but it is still waiting for its binding. 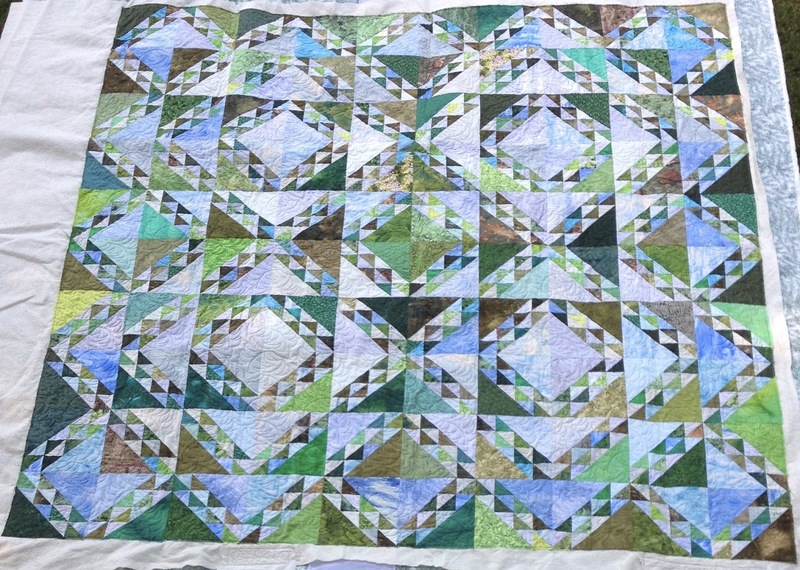 It’s waiting on trimming, as well, as I ponder how much extra to leave around the edge in order to be able to get binding on without cutting off all the triangle points. 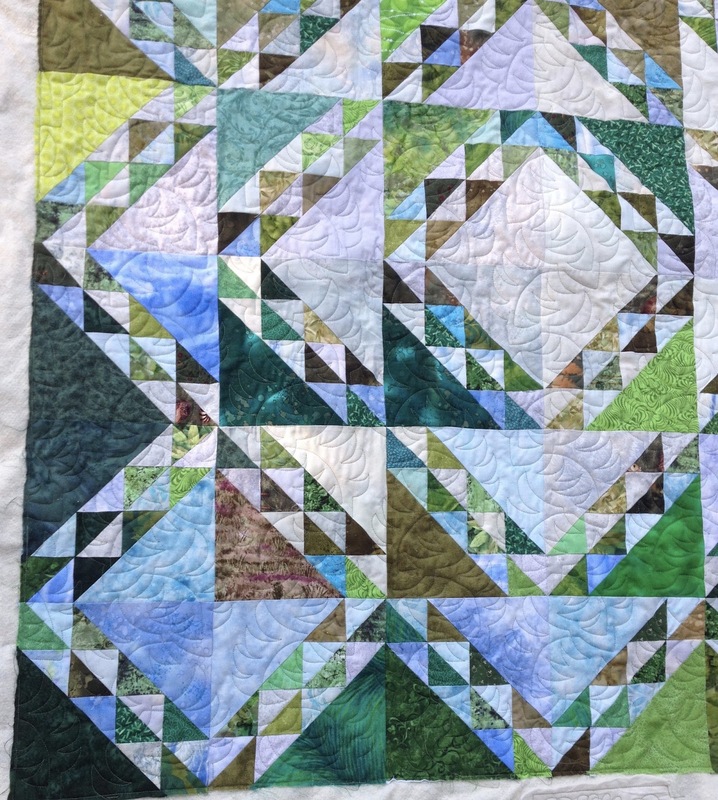 I used a very simple quilting design called Ferns, designed by Barbara Becker. 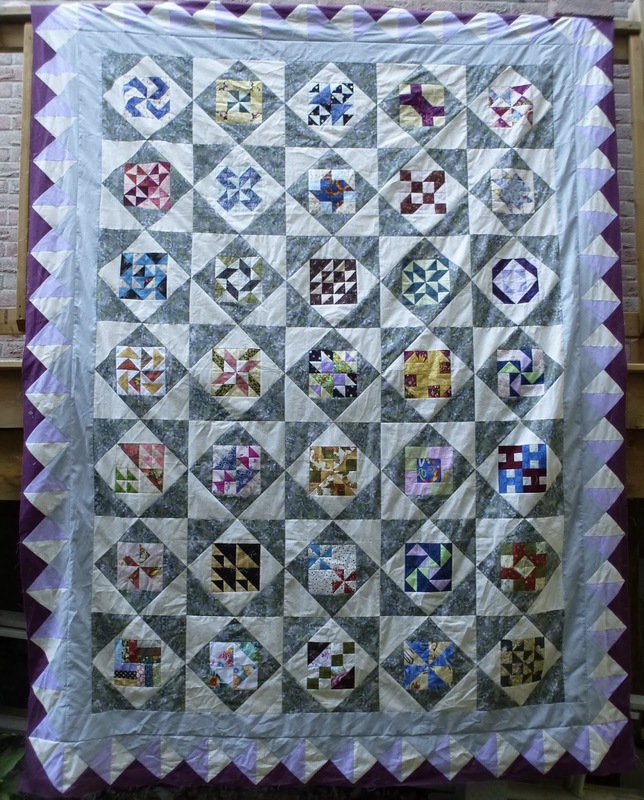 Today I loaded on a very old quilt. It’s called Grandmother’s Diamond Ring. 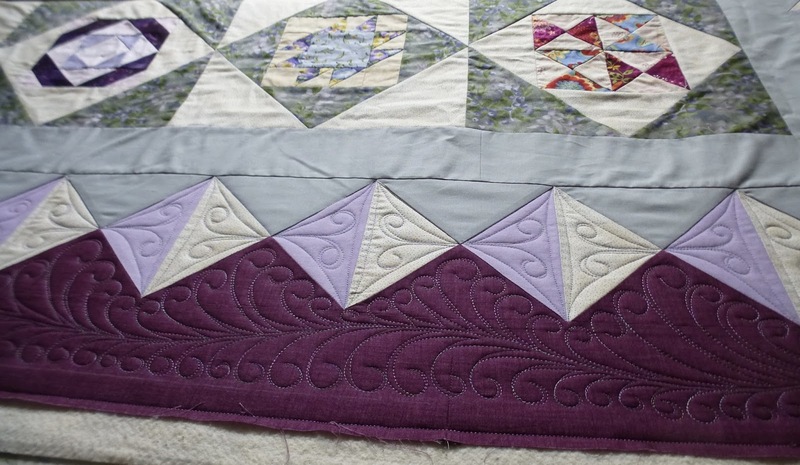 According to records here on the blog, the piecing was finished in July of 2012. I have no record of when I started it. I suspect it pre-dates the blog. Which means it is older than 2010, which is when I started blogging. It’s been hanging around because I wanted something special in the white background hexagons. I finally found that something special earlier this year in the form of these roses. 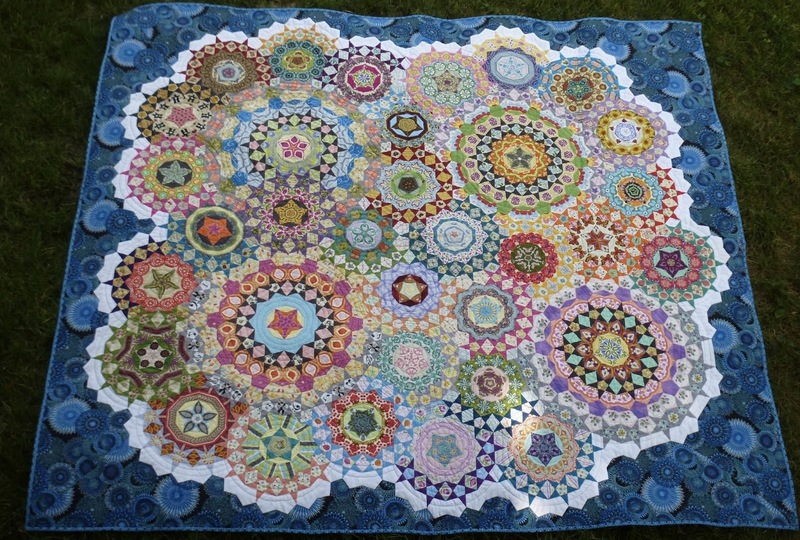 It’s a Rose hexagon designed by Judy Allen and Jessica Schick. I have a stencil for the border using the same rose that I bought years ago. Maybe that’s why the roses in the hexagons caught my eye. 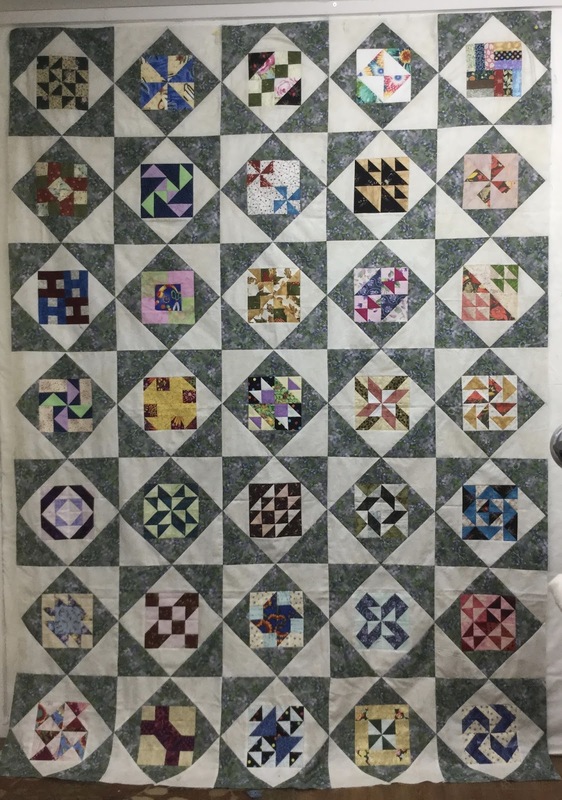 It’s kinda hard to see the design in the border, but the picture can be biggie sized if you click on it. This one is going to take a while. 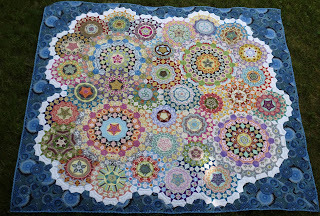 The borders have to be marked with chalk and the hexagons each have to be marked with disappearing marker. 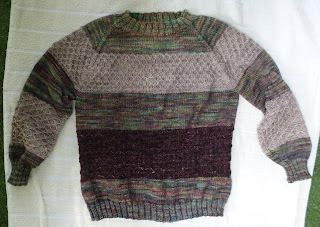 I worked on it most of the afternoon, but a large part of that was spent figuring out how to do the borders. There isn’t a corner turn on the stencil, so that took a bit of thought and finessing. This will likely be on the machine for the rest of the week. 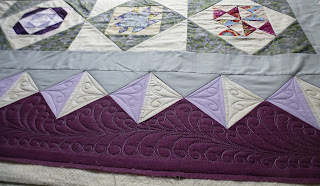 I’m continuing to work on the binding for La Passacaglia. I’m hoping to have it done for a Friday finish celebration. I haven’t done one of these in a while. It’s been machine sewing all the time, with no hand sewing at all. But that has now changed. 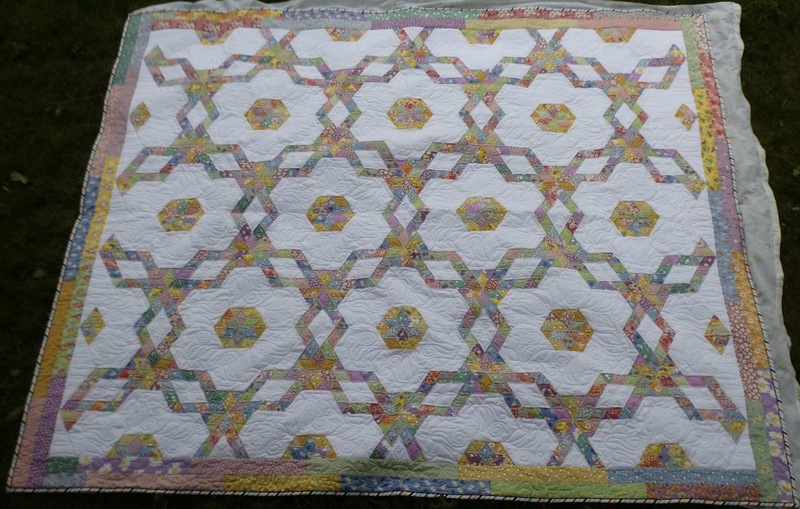 My La Passacaglia is all quilted, and off the machine. 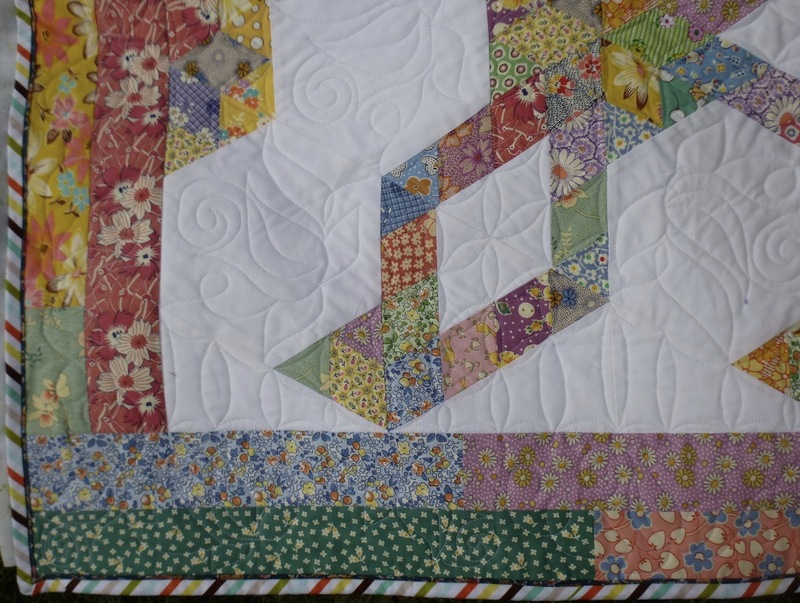 The binding is made and sewn onto the front of the quilt. Now comes the long, slow process of hand sewing it to the back. I usually do my bindings by machine, but after all the hand work on this piece, it seemed appropriate to do the binding to the back by hand. I’ll plant myself in front of the gymnastics competition in the olympics, and stitch until it is finished. As far as the stash goes, the added numbers are winning, which means there was a little bit of fun shopping last week. Most of what I bought was for the guild’s comfort quilt program, so it doesn’t count as in numbers for me. However, there was a diagonally printed stripe different from any other I have, so 2 yards of it was added in. This report is from the 11th to the 31st of July. I think I’m going to start doing these monthly to make it a bit easier to keep track, rather than the hit and miss it is right now. 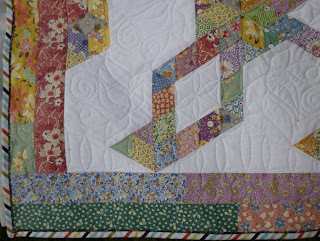 And now, after linking up to Judy’s Stash report and Kathy’s Slow Sunday Stitching, I’m back to doing the binding. It has been a whirlwind couple of weeks around here, packed with activities and work pretty much every minute of the day. 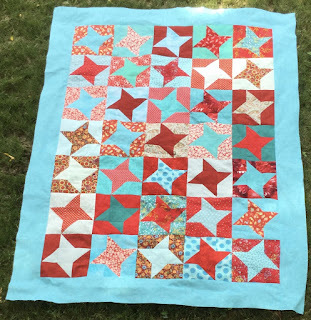 I’ve been trying, successfully I may add, to get all of the back logged quilts done, so that I can devote August to getting my own projects done. 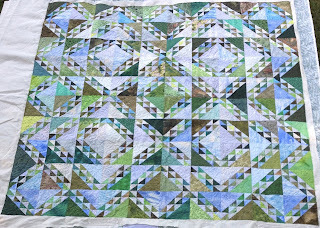 In addition to that, there was a sewing day at the guild a couple of Saturdays ago, during which we finished up a comfort quilt top, and I also finished up the body of the blog sampler. I then, well, not really right away then, but sometime in the last couple of weeks, got that same comfort quilt quilted. Then a week ago today, Gail came over and we sewed together another comfort quilt. Maybe I should explain these a bit. 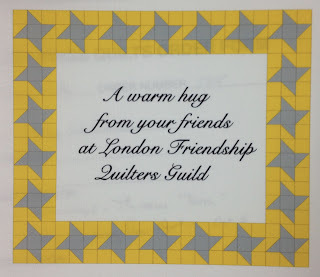 The Friendship Star squares are being made by the guild membership. The colours are assigned, for these last ones the colours were grey/yellow and aqua/red. The members make the blocks in sets of two, with the colours in reversed placement in the blocks. 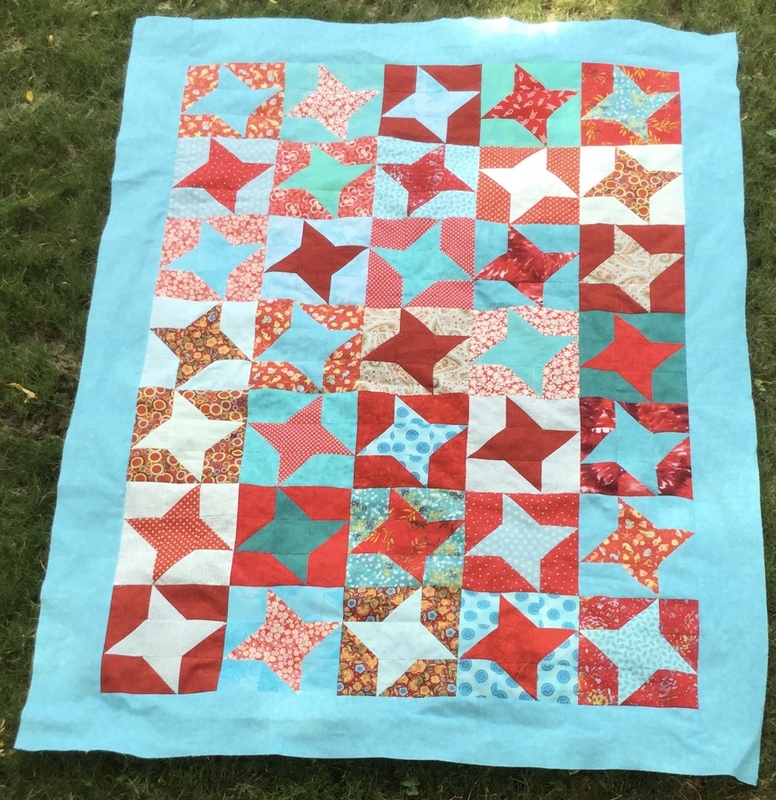 The comfort quilts are intended for guild members who are going through “life altering” situations, whether it be illness, family loss, business loss or other sad situations. 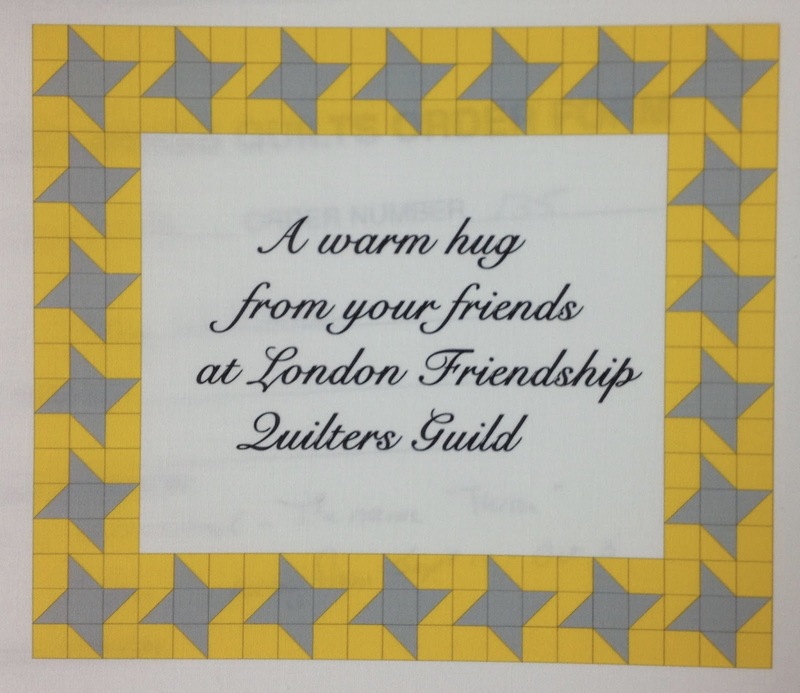 Each comfort quilt gets a label like this. 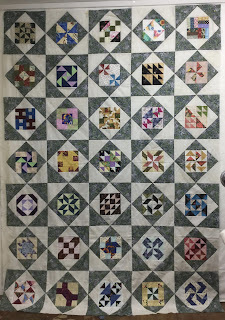 In addition to this, I’m trying to get the blog sampler quilt finished. 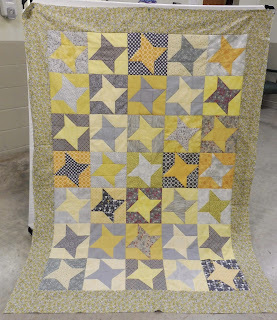 It now has the inner border and the pieced borders on. One more set of borders to go, and it is done. The picture was taken earlier in the week. I don’t have an updated one with all the pieced borders on, but you get kinda the idea. Then this past week, we had company. Avery came to stay with us for a couple of days. He arrived Monday night, and stayed until Wednesday evening. We went on an adventure to the park on Tuesday afternoon, along with Grampy and Aunt Becca and cousin Abbie. 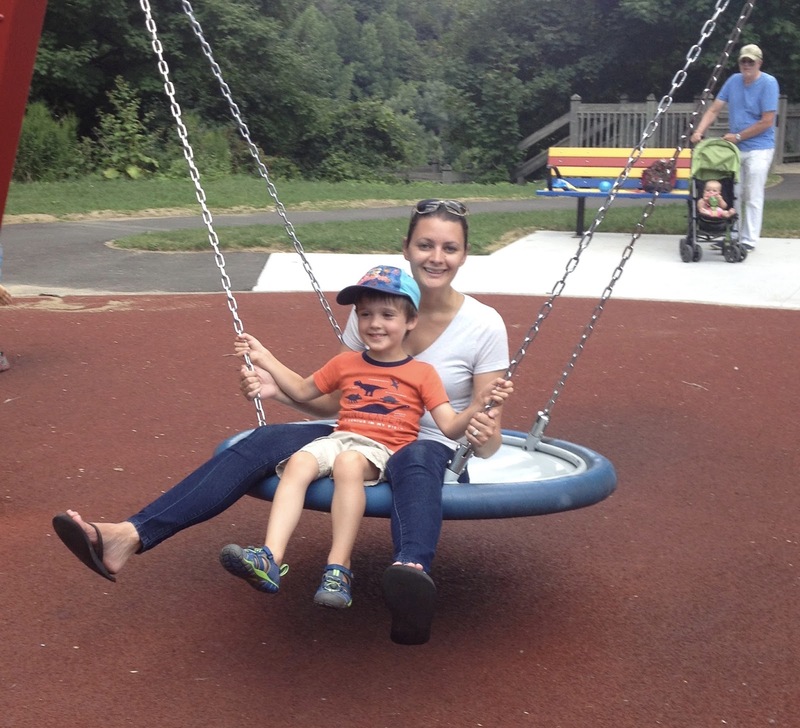 Aunt Becca went on one of the fun swings with him, while Grammy took the pictures and Grampy watched with Abbie. These were the only pictures I took. The rest of the time was spent enjoying being with him. I must confess to a small amount of exhaustion after her went back to his Daddy, though. 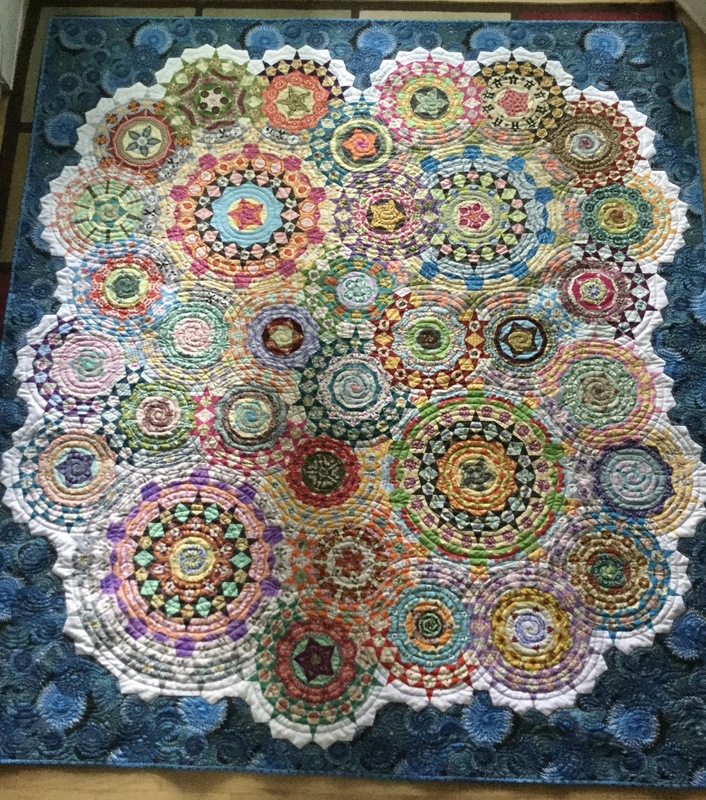 After this, I got serious about getting La Passacaglia quilted. 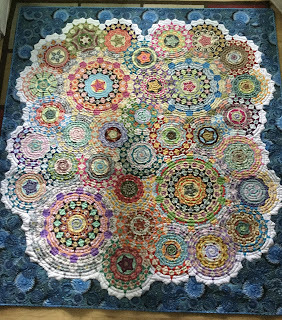 I’m doing concentric circles in all the rosettes. 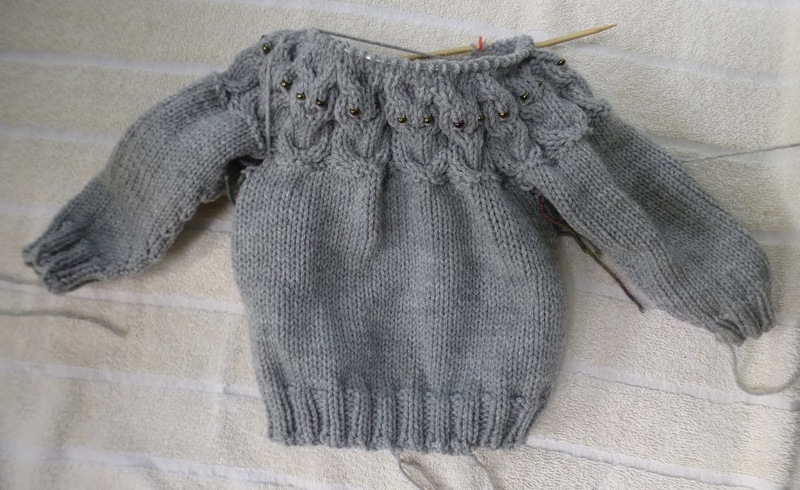 It is a long, time consuming process, but I’m hoping it will look great once it is done. It just might get finished tomorrow. And of course, through all this, there has been lovely time spent with this precious baby girl. She is crawling all over the place now, and is pulling herself up, using whatever she can get her hands on, in order to stand. Another couple of weeks and she’s going to be cruising around furniture. And she only turned 7 months yesterday! It’s difficult to get a good picture of her these days. She isn’t still long enough. SO, that’s been my life for the past while. Too busy living it to write about it. Will it slow down in the next while so that I can catch up? Hard to say, but not likely.